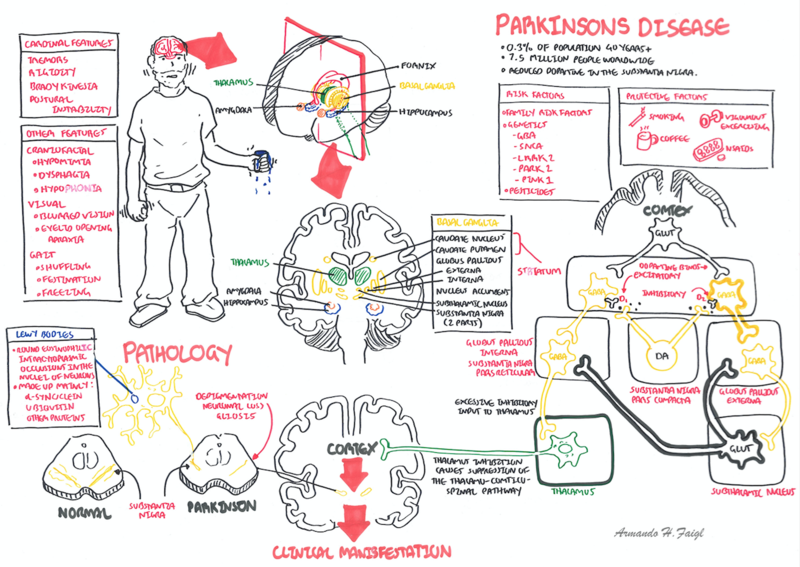 Overview Parkinson’s disease is a progressive neurodegenerative disorder characterised by tremor, rigidity, bradykinesia, and a wide spectrum of non-motor symptoms including sleep disorders, hyposmia, bladder and bowel dysfunction, fatigue, dementia, and other neuropsychiatric symptom. Although the disease has no cure, available treatments effectively control motor symptoms and improve quality of life. Parkinson disease affects approximately 1 percent of persons older than 60 years, and up to 4 percent of those older than 80 years. Parkinson’s Disease: Progressive, degenerative brain disease that causes trembling, stiffness, slowness of movement and a loss of fine motor control. Idiopathic Parkinson’s disease: or Parkinson’s – is the most common type of parkinsonism. Unlike some other forms which have specific causes it is not known why idiopathic Parkinson’s occurs. Idiopathic means that the cause is unknown. Akinetic Rigid Syndrome: Defined by paucity and slowness of movement accompanied by muscle stiffness and resistance to passive movement. 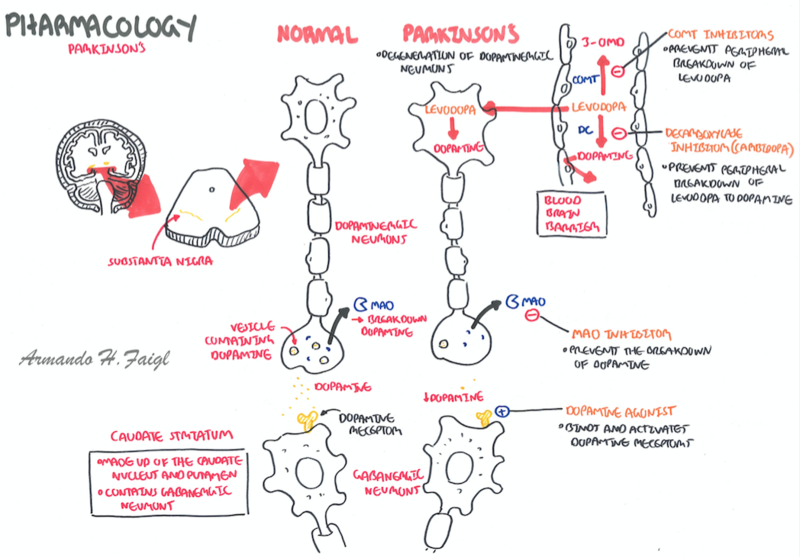 The akinetic–rigid syndrome is typical of idiopathic Parkinson’s disease, so is often described as the syndrome of parkinsonism. Four Cardinal Signs of Parkinson’s: Resting Tremor, Bradykinesia, Rigidity and postural Instability. Problems with fine motor tasks: writing, sewing or getting dressed. Glabellar reflex is a primitive reflex. It is elicited by repetitive tapping on the forehead. The tapping causes the person to blink but after a while blinking stops. In Parkinson’s Disease blinking persists. Asymmetrical, neck and shoulder muscles prior to face and extremities. With progression, affects the whole body and reduces the ability to move. Tremor, often combined with slowness and stiffness in an arm, presents frequently in general practice. It may be caused by essential tremor, which affects 2-3% of the population. Differentiating essential tremor from Parkinson’s disease can be difficult, even for experienced physicians. ET 10 times more prevalent than PD. ET is a postural ± action tremor. A severe postural tremor may be present at rest but is not ‘pill rolling’. Patients with ET may also have: vocal tremor; head tremor (‘no–no’ or ‘yes–yes’). In PD there may be: jaw tremor; leg rest tremor. No diagnostic test for PD. Diagnosis is made on clinical grounds. slit lamp examination for Kayser–Fleischer rings. MSA patients may have degeneration of Onuf’s nucleus—detected as polyphasic potentials with ↑ latency on urethral or sphincter EMG. Autonomic function tests, if MSA differential. Similarly, a cognitive assessement: dementia is unusual in MSA. Side note DaTscan is a dopamine transporter (DAT) single photon emission computerized tomography (SPECT) imaging technique. It provides a potential tool to evaluate patients with unclear PS symptoms. It can be used to differentiate between disorders of essential tremor or drug induced PS. These features are unilateral at onset, but become bilateral as the condition progresses. Later, postural instability and falls, orthostatic hypotension, decreased olfaction, micrographia and dementia. Side note Imaging plays a limited role in diagnosis and should not be used routinely. Hallmarks of PD are the presence of Lewy bodies + neuronal cell death in the pars compacta of the substantia nigra. 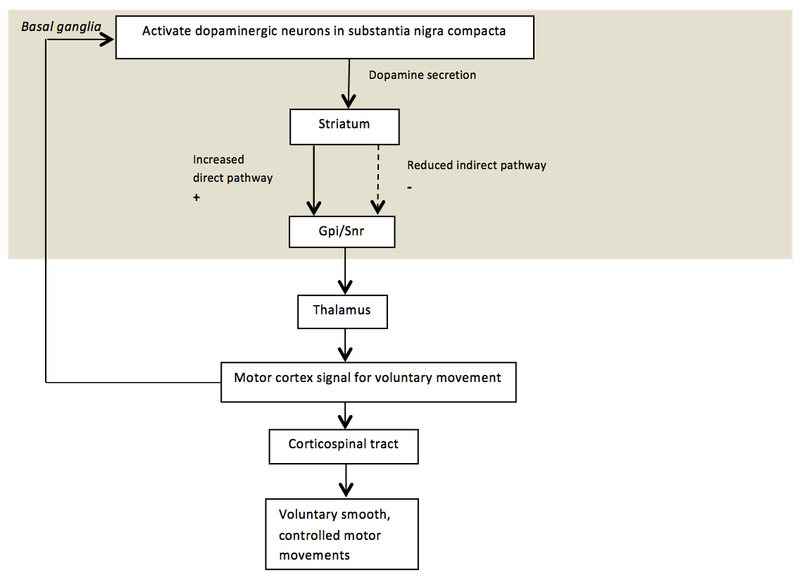 PD does not develop until striatal dopamine (DA) levels drop to 20% and substantia nigra (SN) cell loss exceeds 50%. Caribidopa prevents peripheral conversion of levodopa to dopamine by blocking dopa decarboxylase. Deep brain stimulation of the subthalamic nucleus can improve Parkinson’s disease symptoms. Progressive decline in motor and cognitive function and increased mortality. Risk factors for more rapid decline in motor function include older age at diagnosis, and prominent bradykinesia and rigidity at diagnosis. Sixty percent of patients with Parkinson disease develop dementia within 12 years of diagnosis. Overview Essential tremor is an important differential from a pill rolling parkinson tremor. Postural or kinetic tremor in the frequency range of 4 to 12 Hz (usually at the lower end of the range in older patients) is generally the only manifestation in patients with essential tremor. Occasionally, when severe, rest tremor and mild abnormalities of tone and gait may also occur. A family history of this disease and temporary benefit after drinking alcohol are common, but not invariable. 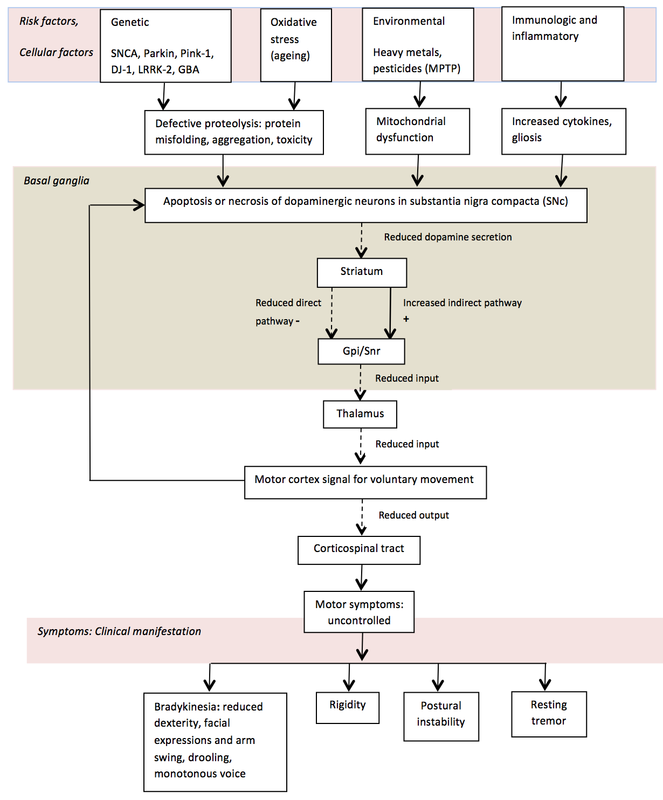 In patients above 40 years of age neurodegenerative disease is the commonest etiology of akinetic rigid syndrome. In this group idiopathic Parkinson’s disease (PD) needs to be differentiated from other syndromes as it carries a better prognosis. These diseases are slowly progressive and have characteristic extra pyramidal signs progression and associated neurological involvement.